Thank You to our Recent Grant Funders! Thank you to our recent grant funders. With your support, the San Gabriel Educational Foundation will continue to enhance the quality of education our students receive. The following programs are supported in full or part by the following donors: San Gabriel Community Foundation & Smart & Final, Food for Thought – Young Chefs in the Kitchen; San Gabriel Women’s Foundation, Holiday Book Event. We are stronger because of you! As one of the largest and most visible organizations in San Gabriel, The Los Angeles/San Gabriel Hilton is a leader in our community. Since partnering with the San Gabriel Educational Foundation in 2010, they have made an enormous impact on the lives of SGUSD students. Their generous donations of over $150,000 to date, represents their commitment to academic excellence and the success of youth in our community. The Hilton’s consistent support has resulted in significant improvements in programming within our schools. The Hilton Hotel, as a business leader in our community, has shown that when we invest in our public schools, it is not just an investment in our children, but also in the future of our community, our civic leadership and our prosperity. The San Gabriel Educational Foundation deeply appreciates The Hilton Hotel, Mr. Carl Bolte, Ms. Juli Costanzo and their entire team, for their accomplishment in uniting the community behind our efforts to secure a stronger public school system for the 5,341 students who benefit annually from their generosity. Support from business leaders like The Hilton helps to provide every child access to the well-rounded, quality public education that is necessary for them to reach their full potential and to become successful future leaders in and beyond our community. The San Gabriel Community Foundation awarded SEF with $5000 to bring an after school healthy choices and nutrition program to SGUSD. This program will include a cooking component as well as education for students at Jefferson Middle School and parents in the community. The San Gabriel Community Foundation is a collaborative effort with the California Community Foundation to meet critical needs in the San Gabriel Community. The foundation was formed by a partnership between the City of San Gabriel, San Gabriel Unified School District, Church of Our Saviour, and the San Gabriel Valley Medical Center. Grants are awarded to non-profit organizations to support programs that promote health education, wellness and the delivery of health services. 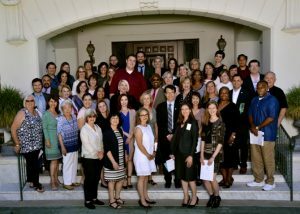 The Pasadena Tournament of Roses has provided a very generous grant of $19,000 for SEF to implement a theater and dance program for young learners in grades 1-3 in SGUSD. performing and visual arts and volunteer and motivational programs. To date they have given over $3 million to more than 200 organizations.